Confession: I always assumed “spring cleaning” happened in, you know, Spring. And yet, for me, the bug for organization always comes in the middle of winter. I guess the increased time indoors (I am SO not a snow bunny) eventually makes me go sir crazy. Also, a New Year means tax returns, which usually results in me getting a little something for the house. Since I finally saved enough to get myself a (very cheap) couch and ottoman – to keep both me and the cat happy, you know -I’ve been quiet lately as I attack the living room seeking some semblance of order. This year my additions were -first and foremost END TABLES. Real fricking end tables-not this odd mismatch of TV trays and nightstands we’ve been living with for a decade because, well, they came with the house and we had to put cables and cups somewhere. The storage ottoman takes care of the prior (as well as giving me an extra chair for company), cheap end tables will take care of the latter. Next up was new counter stools -which have been patched with electric tape for years, and a computer chair that doesn’t sink on me at random intervals. And then, a fold away exercise bike so I can quit the darn gym – I hate going because it’s too crowded, better to exercise at home if I can make the space. 1. It’s the reason I have been too busy to record my newest song for you. There’s another new one. I’ll get around to sharing it eventually. 2. After all the house stuff, I wanted a toy in the mix somewhere, so picked up the extension cab for the Blackstar Fly I got for Christmas. Pictured here flanking my bose speaker. 3. 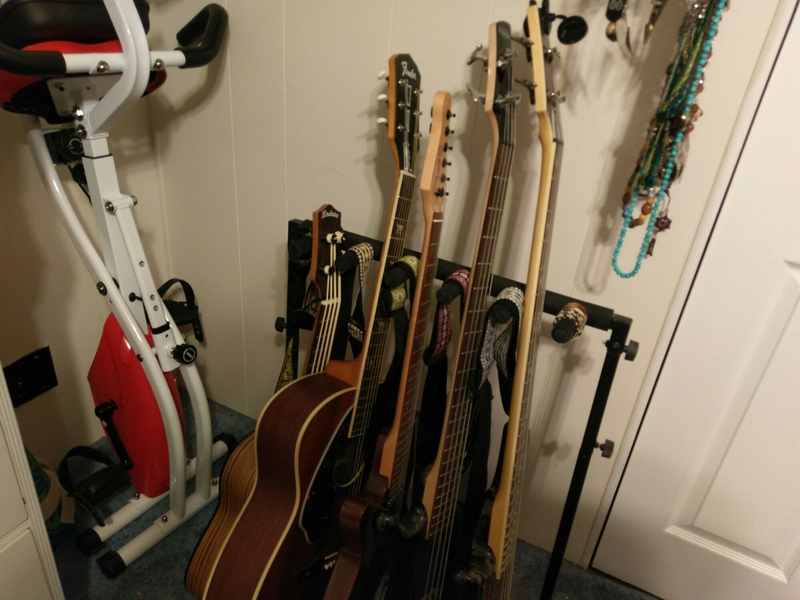 Making room for the bike meant reorganizing again, which meant my amp corner needed to become my bike corner. That meant my amps and such needed a new home. I disassembled most of my sewing corner, relocated my PJ drawer, made the old PJ drawer my sewing drawer, relocated my fitness stuff and some video games, and created a new bit of music space to slide said amps into. 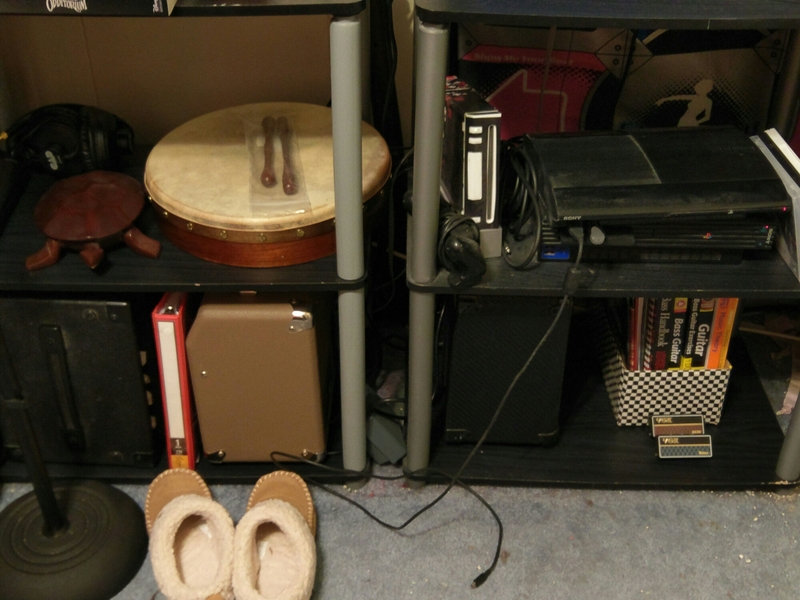 I even found an official space for the bodhran. And, I put the music books where I can see them, so maybe I’ll make myself use them (I have been dipping into Bass Basics a bit this week, too, but nothing to say about it for the time being). The turtle is where I keep my guitar picks. It’s not out-of place, really! I have no excuse for the slippers. So, that’s what’s up for the moment as I count the days toward evening daylight. I haven’t forgotten you all. Just seeking some semblance of order. I see a Hadean Ubass in your collection. How do you like it? I just got the Oscar Schmidt ubass and it’s a lot of fun to play. Yeah, I missed the lefties the first time out, so snagged it when they were available again. I don’t fiddle with it much, but I do pull it out when I’m working on exercises a fair bit because I don’t have to plug in to hear it and it’s really portable. 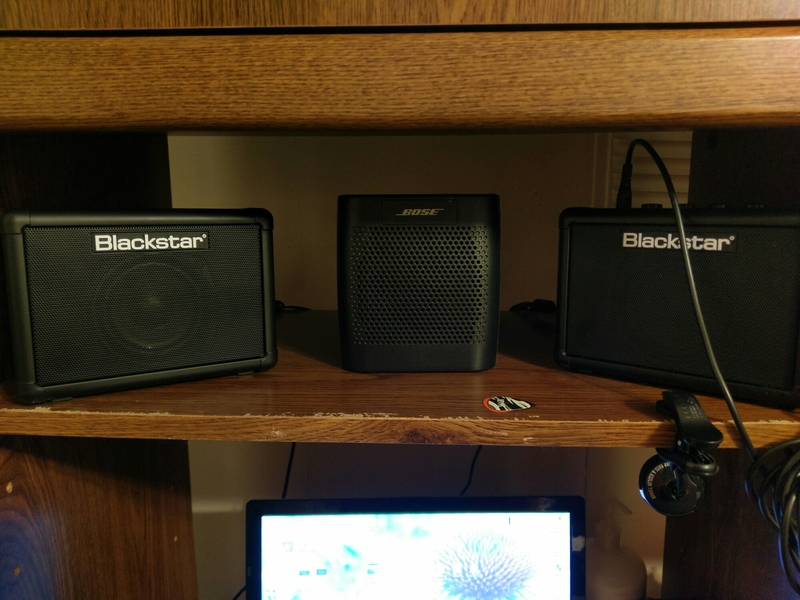 It is VERY quiet, but it’s louder than an unplugged electric bass, so I can hear it over the TV, which is really all I need, and it has electronics, so I can plug it in if I need to get more volume. Overall would call it a steal for the price, but I barely manage to get from point A to B on bass – you can still file me under ‘ultra-beginner’ on that instrument, so I can’t offer the in depth insight someone who genuinely knows how to play would. It’s a nice alternative to an acoustic bass though, I think, since acoustic basses tend to be gigantic and I’m…well…not tall. That’s why I got one. I like it’s sonic similarity to an acoustic bass, and I think that it will come in handy for some songs. I had an ashbory bass before, but the silicone strings drove me crazy and the intonation was bad and not adjustable. I sold that, and recently had heard a bass player play one and was amazed. I like the ability to plug it in and it still sounds like an acoustic. When I went to that uke fest a few years ago, the guy who did the bass seminar talked about the ashbory. I think he said the strings were quite sticky. I do notice that some things are a bit harder to do on the ubass strings, but if anything, I consider it good for someone learning. Using those clunky strings requires a gentle touch, which isn’t something I excel at naturally. I still tend to fret strings too hard. Also, there’s some advantage to working on a smaller scale with new material. I think the bass strings don’t allow an much room for being sloppy, which can only be to my advantage in the long run, probably. They were very sticky! It was suggested to use talcum powder prior to playing, but that got to be a hassle. Plus, unless it was plugged in, it was useless. He said that, too. I remember he cracked a joke about how you wore all black for gigs and had to use Talcum powder, so you ended up a mess. hahaha! I hadn’t thought of that, but yes. Not a good look!